A West Belfast Walking Tour - Madness? "You mean I am actually supposed to walk in a war zone?" Well, yes, of sorts - but times are a-changing. When I first walked the streets of West Belfast in the very early 1980s I would not have recommended the experience for the faint-hearted. Some kids took time out from talking to me to throw a few handy bricks at a passing police car. After getting a snack in a shop under the serene glance of Queen Elizabeth II a few concerned citizens asked me about my business in their neighbourhood with a bit more than a hint of madness in their eyes. And then there was the moment when I fumbled with my camera when an armored car passed by, earning me the undivided attention of some British soldiers - one of which was pointing a deadly weapon at my head. © 2008 Bernd Biege licensed to About.com, Inc.
One thing that is amazing is how close the two of the main hotbeds of sectarian violence actually were to the city center. If not a stone's throw away, a sniper's bullet would make the distance. So we start our walk at Belfast's splendid City Hall in Donegall Square. The City Hall's front lawn borders on Donegall Square North and Donegall Place, one of the city center's shopping streets, leads northwards. Years ago there were checkpoints and searches when you wanted to go this way. This became necessary after an IRA car bomb exploded here in 1972 (killing seven and injuring 150). Follow Donegall Place until Castle Street branches off to the left. In Castle Street you will maybe notice subtle signs that you are entering a nationalist area - like a takeaway seemingly catering for Celtic Glasgow fans. Soon you will reach a large intersection which will take you over the Westlink towards Divis Street. The landmark Divis Tower is on your left as you cross the intersection - dwarfing everything in sight. The Tower and the once nearby Divis Flats were designed to provide low-cost housing for families. While the housing was low-cost, it also was of low quality and in effect, a modern Catholic ghetto was created. This became a cauldron of unrest during the most troubled part of West Belfast's history. Now only the Divis Tower remains while more sensible housing has been erected in the vicinity. The seventh victim of the "Troubles" was killed in the Divis Tower - lying in his bed, Patrick Rooney was instantly killed when hit by heavy machine-gun fire from a police armored car. He was nine years old when he died on August 14th, 1969. Follow Divis Street and the "Garden of Remembrance" is soon on your left. This is a Republican monument to those who died during the "Troubles" - members of the IRA in active service, former members, Sinn Fein members and civilians from the Falls area. A memorial to and for a close-knit community. From here we soon turn left, for a detour to take in Saint Peter's Cathedral. "The Cathedral Church of Saint Peter" serves the dioceses of Down and Connor, which intersect in Belfast. Built between 1860 and 1866, its twin spires were not finished until 1885. The spires have made this a hard-to-miss landmark when approaching Belfast from the Southwest. When driving by, the cathedral seems almost imposing but it loses some of its splendor upon closer examination. The main church is situated in the middle of a housing district which takes away from the view. And while its exterior has been called "not especially remarkable", its interior has never really been rated strikingly beautiful either. This landmark building of West Belfast may be best described as a working-class cathedral in a working-class area, a "citadel of prayer and faith in an otherwise depressing neighbourhood" (all quotes from Peter Galloway's "The Cathedrals of Ireland"). Pay a visit St. Peter's while exploring West Belfast ... then continue towards Dunville Park. On leaving Saint Peter's, turn right and then left again on the main road, heading towards the Royal Hospitals and Dunville Park. This is where you will begin to see many street art murals - depicting everything from fairytale creatures to assorted struggles of the oppressed. The graffiti art is an inconsistent mix at the best of times, showing Palestinian youths joining forces with Basque separatists and Fidel Castro. It is a very simplistic view of the world as black and white and very literal. Once you have reached Dunville Park you can think about turning back. At the crossing next to the Royal Hospitals look westwards first, across Dunville Park - you will see the massive cranes "Samson" and "Goliath" of Harland & Wulff dominating the skyline. Within sight of the Catholic community, big ships like the "Titanic" were built, bringing pride and wealth to Belfast. Or, at least to parts of Belfast ... it was an unwritten policy that Catholics could not be hired in the shipyards. On this sobering thought let us begin backtracking down Falls Road. On the left side of the road, you’ll notice the Sinn Fein political offices with the massive mural of Bobby Sands. The old Carnegie Library nearby is one of the few remarkable old buildings in this area. And if you look into the streets branching off to the leftAvenue you will realize that many were designed as through roads but are now dead ends. This is "the divide" which you are about to cross. After you pass the Divis Tower, you will see a small business park on the left and Townsend Street, running parallel to the Westlink. Turn left here and follow the road through the massive steel barrier that is usually open these days. The first building on your left is a Presbyterian church. This is where you can pass from a Catholic to a Protestant area in a second. There is, of course, a stout wall (dubbed somehow optimistically a "peace line") to interrupt contact in times of need. The not-very enchanting view across some wasteland further on will bring you face to face with a massive mural honoring B Company, the outfit that brought us the appropriately nicknamed Johnny "Mad Dog" Adair. The Ulster loyalist fled Northern Ireland when his own community threatened to relieve him of command by terminating him with extreme prejudice. It was nearby that in 1969 (Protestant) Police Constable Victor Arbuckle became the first RUC officer to be killed in the "Troubles" - shot dead by members of the Loyalist and Protestant Ulster Volunteer Force (UVF). Further evidence of this madness awaits you in the Unionist heartland off Shankill Road. Cross the road near the Gospel Hall and follow Shankill Parade. At the end of this short road you will have a stunning view of an unremarkable green bordered by some remarkable murals. I mean remarkable in many ways: here you will witness the mural honoring Oliver Cromwell, who made ethnic cleansing a brief and brutal fashion in Ireland. The quote attributed to him on the mural states that there would be no peace in Ireland until Catholicism Avenue. 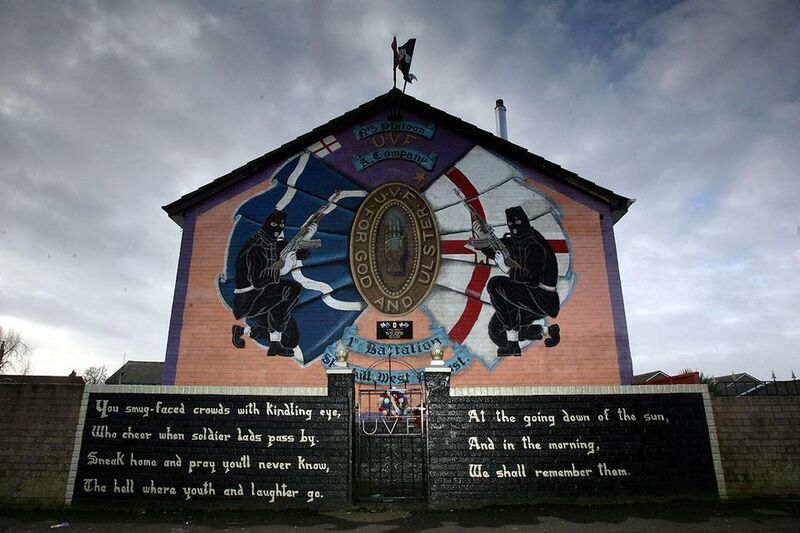 Other murals honor the Loyalist dead, largely paramilitaries who did not pass away peacefully in their sleep. Sometimes the cause of death is given in a blunt manner, like "Murdered by the UVF" - another example of Loyalist feuds. Just a few years ago, lingering here as a stranger, let alone taking photos, would have earned you the brief but close acquaintance with an ad-hoc vigilante committee. But now West Belfast has changed and these days people are more likely to point out the shortest way to their favorite mural to you. It is, however, still advisable to ask permission if you want to photograph anything but the murals and the area in general - close-ups of people or private homes are often frowned upon. After you have taken your pictures, it is time to return to the "neutral" city center. Once you have rejoined the main road near the KFC, follow Peter's Hill across the Westlink and back towards the city center. Soon you will reach Royal Avenue (on your right), which is part of Belfast's shopping district. Follow the Royal Avenue and you’ll notice the entrance to the Castle Court shopping center on your right - in which a large food court offers some refreshments after your walk through West Belfast's history. Answered: What are My Personal Favourites in Ireland? Jewish and Travelling to Ireland? Here's What You Need to Know!